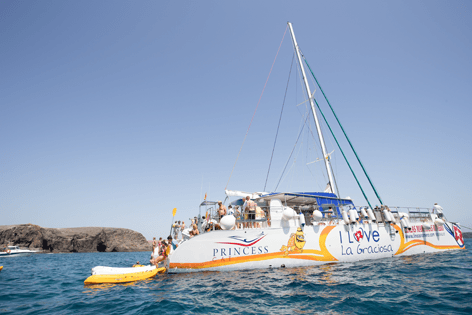 Board the luxurious I Love Papagayo Catamaran to enjoy some exciting water activities, spot dolphins and more only at the beautiful Papagayo beach and bay, a hidden treasure of Lanzarote. Amazing family day trip only from Puerto del Carmen to Papagayo Lanzarote. Book online now exclusively with ExcursionsLanzarote.com. 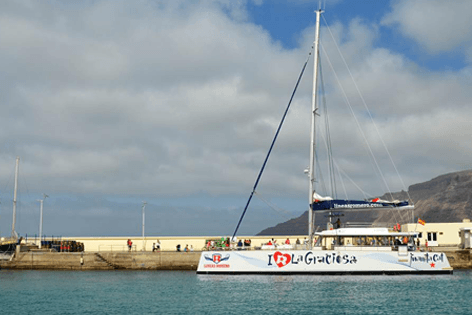 With a beautiful warm and sunny weather in Puerto del Carmen and the quaint harbour, get comfortable onboard our luxury, spacious catamaran and set sail on the clear blue waters towards the hidden bay of Papagayo Lanzarote. As you sail past the stunning coastline of Lanzarote, take in the picturesque views of Puerto Calero and the mighty volcanoes, an amazing contrast only visible from our catamaran, a great opportunity for some memorable pictures. As you arrive at the Papagayo bay, close to the Papagayo beach, you will be served a delicious Mojito. 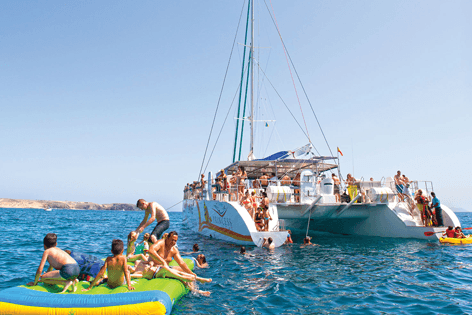 Since the I Love Papagayo Catamaran has an exclusive bar, you can enjoy draught beer, sangria, and soft-drinks throughout the day, so sit back, relax and soak up the sun on the comfortable nets or soft seating areas. 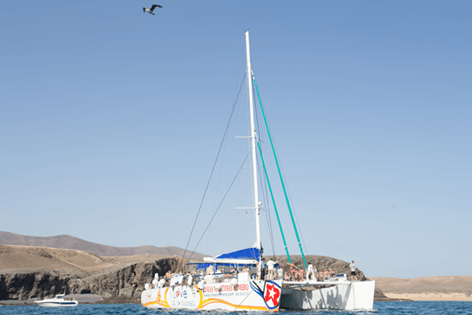 As we anchor off at the cliff sheltered relaxing bay of Papagayo, you can take advantage of the many exciting water activities on offer from snorkeling, kayaking and the inflatable chill out mats or swim across to the Papagayo beach. Guaranteed fun for the whole family. You also have a choice to just relax, enjoy a siesta, take in the stunning coastal sights and sounds of the lapping waves near the Papagayo beach, soothing sea breeze and be completely chilled, you are after all on a paradise island. While you enjoy the day, our chef will prepare a traditional Spanish Paella which will be served fresh for you to relish in our sheltered bar and dining area (Vegetarian option available). As the magical day comes to a close of I Love Papagayo Catamaran, we will pull up the anchor and set sail back to Puerto Del Carmen. But wait, keep your eyes open for our sea friends we usually bump into, friendly dolphins and flying fish, a spectacular finish to the Papagayo trip. An amazing day tour of I Love Papagayo Catamaran with family and friends. A must and exclusive for all those staying in Puerto del Carmen. 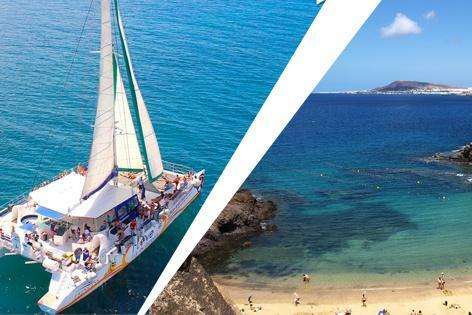 Book now online, we are the only company selling the tickets online, so hurry up reserve places for your family and friends for a memorable catamaran day trip to Papagayo Lanzarote from Puerto del Carmen. The highlight day trip of your holiday in Lanzarote.